We’re all set for another special occasion brunch menu! And, of course, this time we’re focused on a special Valentine’s Day brunch! We’ve already sent the menu and the first recipe out to our Breakfast with the Broads email recipe subscribers… but we’ll share a few recipes and the menu with you too! If you want the entire thing, make sure you’re on our list to get our weekly recipe emails! Our Valentine décor is red and white (sometimes with a splash of pink) so I try to make the breakfast menu to compliment it. Great red fruits to add color for Valentine’ s are Strawberries, Raspberries, and Pomegranate Seeds. Day after the first snow. but at times I had to do some real self-talking to keep out of a slump. It started in December when we were snowed in for nearly two and a half weeks. There were days of brief sunshine which of course I inhaled with great joy, but it didn’t take away the snow, it just made it crispy and icy. It rained a couple of days, so on top of the snow it iced up the road, making it impossible to get in and out of our driveway. It was relief to finally get out on New Years Eve. I don’t think I really appreciated ‘freedom’ until it wasn’t easily attained. I am usually quite a homebody and can stay at home for weeks without any thoughts of leaving. Those few weeks became quite a test!. Next came the fog, thick peas soup fog which lasted for days! Freighter coming out of the fog. worked at it. As a friend said “We did not have a burning desire to extricate ourselves from paradise!” After Christmas we were able to move our car to the end of the driveway, but the snow melted and froze the tires into the ice. We worked our way back to the house for another five days while Mother Nature melted it. The photographic opportunities over the month were wonderful, such a variety of ever changing scenes. I hope you enjoy them! These two are my favorite. I took them through the glass on the front deck. Jack Frost’s artwork in the foreground! Several great things happened during this month of strange weather that helped me re-focus on the bigger picture. First my mom and our daughter were able to get in and out before Christmas. Second we had a short day in Victoria so mom could have a visit with our son. Third and most important to me our son and daughter, their spouses and dogs made it in on Christmas Day. Through knee deep snow (no they were not barefoot in driving winds walking a mile!) they were able to carry their bags over their heads and no one slipped on the ice. Even our friends made it for dinner, although when they realized how bad the roads were they left shortly after dinner which meant we missed out on “Are you Smarter than a Fifth Grader?” Whew! Our kids would have cleaned up!! This is such a delightful recipe – and easy to prepare too! Make the night before and put it in the oven in the morning for an easy to make and sure to please brunch! Grease a 3 quart rectangular baking dish. Add pears and 2 tablespoons of brown sugar to the pan. Cook pears over medium heat for 4-5 minutes or until pears are just tender. Layer 7-8 bread slices in prepared baking dish. Spread a layer of pears over the bread (using all of the pears) then place Brie on top. Top each stack with another bread slice. In a small bowl, combine granulated sugar and cinnamon. Sprinkle evenly over bread. In a medium bowl, whisk together milk, eggs, vanilla and salt. Slowly pour mixture over bread slices. Cover and chill for 1-24 hours. Bake, uncovered for 40-45 minutes or until edges are puffed and golden. Serve warm with maple syrup, berries, honey or cranberry conserve. Add smoked bacon or sausage links on side. **I couldn’t convince Dad to stop playing the Wii long enough to make this recipe! So, I tested it out instead!! I can cook but I am not that good at presentation!! For the first week of January we held a poll as to which recipe you liked the most from our blog in 2008… and this one won – without contest!!! So, this is a re-posting of the recipe!! YUMMY. Makes 6-8 pieces of pie. In a small pan over medium heat, fry onions with a tablespoon of butter. Cook onions until they are clear and soft. Turn off heat. Add goat cheese to pan with onions and stir until well mixed. Scrape mixture from pan into the bottom of the pie crust. In a large bowl, whisk eggs with milk. Once mixed, add dijon and salt and mix together. 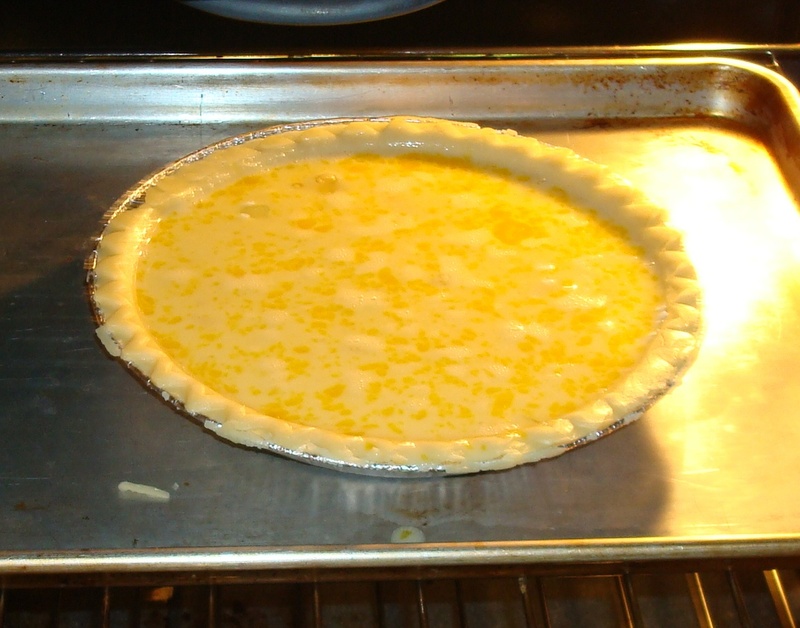 Pour egg mixture over the goat cheese and onions in the pie crust. Bake in the oven for 20 minutes, until mixture is loose on the top but getting firm around the edges. (You might want to cook it on a cookie sheet as my pie spilled over the edges a bit when I added the tomatoes in the next step). 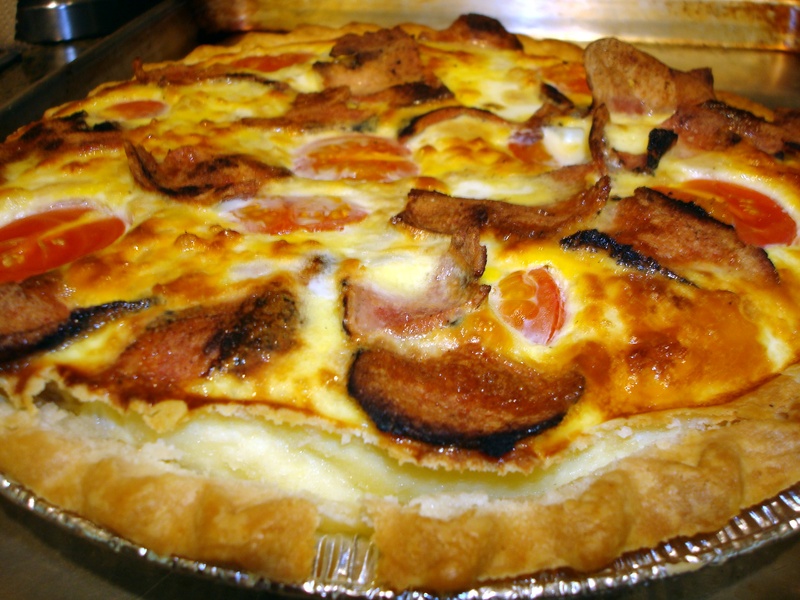 Break bacon into medium to small pieces and sprinkle over top of the egg mixture. Add tomatoes and distribute evenly around the pie. Sprinkle with chives (optional) and serve with toast. Bram waiting patiently...hoping for just a little sliver. Plan a fantastic four course brunch using the FREE Breakfast with the Broads Brunch Planner. It comes complete with theme ideas, menu plans, shopping lists and recipes. Get your Brunch Planner and Weekly Recipes by e-mail at the Breakfast with the Broads website.